Imagine………. growing up in the bustling city of Bangkok. 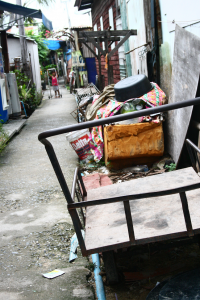 All you have ever known is what life in a Thai slum has to offer you. By the time you are thirteen its time for you to grow up and start bringing money into the household. It is easier to quit school and work full time. At least then maybe you can help your family survive. This is a picture for many children and youth growing up in the midst of poverty. An entire generation of disadvantaged youth will slip between the cracks of society. This contributes to the ongoing cycle of injustice, poverty, and exploitation. Thai youth that are directly affected by poverty, lack of opportunity and poor mentorship are subjected to crime, prostitution, drug and substance abuse, teenage pregnancy and child labor which in turn prevent these youth from completing their education. With little or no education they have no choice but to enter the labor market in situations that can be psychologically and physically damaging in the long run. They will not have the training, skills and character needed to successfully compete in the labor market later in life or live a life that will contribute to society. What can we do to end this cycle for this generation and the next? That is what we asked ourselves…..
Nak Suu Rugby Academy, Live Life, Nak Wing, and Safe Child are amazing opportunities to contribute to the lives of under-priviledged children and youth in SE Asia. It is our heart and hope that each child has an opportunity to develop necessary training, skills and tools to reach their full potential in life and have a positive lasting legacy of hope to provide to their children in the future.